It wasn't too long ago I was able to show a picture from one of our cameras during the 9pm newscast and we were still able to see a little sunlight on the horizon. Monday evening, the horizon was dark. The sun set Monday evening at 8:16pm, when on June 21st the sun set at 8:36pm. By the time we end the month of August, the sun will set at 7:31pm! We will continue to lose a couple minutes of daylight until the beginning of Winter, when the days slowly begin to get longer. The thought of any additional rainfall may make those who suffered from significant flooding a week and a half ago a little nervous. But the good news is the rainfall expected this week won't be as significant as it's been with past storms. pressure system's track. This places the heaviest rain corridor over Wisconsin, Minnesota and northern Iowa. There, a couple inches of rain could occur between now and the end of Thursday. The second image on the left is from the Weather Prediction Center three day rainfall outlook. Following the passage of the low Thursday night, skies will remain cloudy with scattered showers and isolated thunderstorms into the weekend. It has been an absolutely beautiful weekend. Highs Saturday and Sunday warmed into the upper 70s and low 80s under partly cloudy skies and low levels of humidity. Most of Monday will be dry, but an incoming upper level wave to the northwest may allow a few more clouds to spill into northern Illinois and southern Wisconsin during the afternoon. A pattern change, however, is in the works that will feature a much cooler start to the month of August. Low pressure will move southeast out of southern Canada beginning Wednesday, bringing with it a chance for thunderstorms both Wednesday and Thursday. Storms Thursday could be strong ahead of a cold front if enough instability is able to develop during the afternoon and evening. cooler air mass will follow for the remainder of the week and weekend. Skies will likely remain mostly cloudy, holding temperatures down into the 70s. Scattered showers and isolated thunderstorms will be possible both Friday and Saturday. Temperatures will remain slightly below average through at least the first week and a half of August. Average highs during the beginning of August should be in the 82 degree to 84 degree range. After a beautiful end to the work week, we hung on to the nice weather to start the weekend! Temperatures have been a little cooler in the upper 70°s, mainly because there's been a few more clouds. Those clouds will clear out during the evening as that high pressure system to the north will move closer to our area. Temperatures will be in the mid 70°s this evening as well. As the skies clear and the sun goes down, temperatures will cool pretty quickly, bringing us a chance for some light fog during the overnight tonight. That high pressure influence will remain with us for the end of the weekend and the start of the work week. The reason for the quick transition from wet weather to dry weather actually started out east. That large high pressure system over the Great Lakes has pulled cooler air down near the tropics, which will strengthen that low pressure system off the east coast. This in turn will strengthen that cooler air inflow, and will then cause a deep trough to develop over the deep south. This will set up strong sinking motions to take place over the western Great Lakes, which is why we'll continue to see dry weather up through the middle of next week. A low pressure system will pass north of us to start the work week, but all that will do is give us a few more clouds. That low pressure system will track eastward on Wednesday, extending a cool front towards our area during the afternoon and bringing us some light rain. High pressure moves in for Thursday, but while that low tracks eastward, it'll cause another upper level trough to develop, this time over the midwest. This will create a second low pressure system, which will bring us another light rainfall during the overnight Thursday night. With these two light rain showers, we're not expecting a lot of rain. Combined, it'll be a little over half an inch at most. This won't raise river levels, but it may briefly stall the levels. That low pressure system will track eastward Friday evening, taking the upper level trough with it. Then, the high pressure system will fully settle in to end the week. Temperatures will be in the low 80°s to end the weekend, slightly warming up to the mid 80°s by Tuesday. The rain will keep us in the low 80°s on Wednesday, but the resulting cool front that day will end up cooling us down into the mid 70°s for Thursday. After that second low gives us our second round of light rain during the overnight on Thursday and that high pressure system fully settles in, temperatures will cool down into the low 70°s for Friday and Saturday. It's been a great end to the work week! A huge relief, especially after all the rain that we've had. We have a high pressure system up to our north, which has helped keep the skies clear and keep the temperatures more mild. The nice weather stays with us through the overnight, where temperatures will cool down to the upper 50°s. Temperatures will cool off more quickly after sunset and because of that, we may see some light fog during the overnight. The high pressure influence will keep the beautiful weather in our area over the weekend, with temperatures staying in the low 80°s and the humidity staying low. The reason for the quick change from hot and humid weather to cool, drier weather is actually having to do with something out east. The large high pressure system over the Great Lakes will be pulling cooler air down into the tropics, which will create a strong low pressure system off the east coast. The low will strengthen the inflow of cooler air, resulting in the upper level jet developing a trough over the deep south. To the west of the trough will be an area of sinking motion, which will help to further strengthen the high over the Great Lakes and keep the dry weather with us through most of next week. A low pressure system will move up north of us in Canada on Wednesday, but it'll have an extended cold front move towards our area, bringing us the chance for some rain in the afternoon. We're only expecting less than an inch of rain. This won't raise river levels, but it may stall the river levels for a couple of days. However, by Wednesday the river levels will be closer to minor flood stage levels, so even though they'll stall they're not gonna be a dangerous levels. Other than Wednesday, the high pressure system will dominate all next week, keeping the skies clear and temperatures on the cooler side. We'll start the work week in the low 80°s, cooling down to the mid 70°s by Thursday. 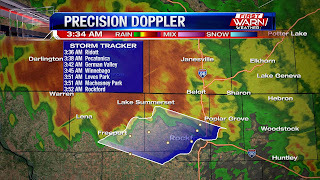 You've probably heard about the flooding ongoing recently near Freeport and Pearl City, Machesney Park and Roscoe, and also west in McHenry and Walworth counties. Multiple rounds of heavy rain have battered the Stateline area over the past several weeks...but how much rain have we received? For Rockford the past couple of months have been 'above average' when it comes to rainfall. 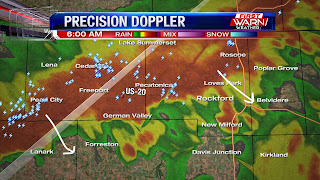 A strong 'ring of fire' pattern is what's responsible for the multiples round of strong storms over the Stateline. 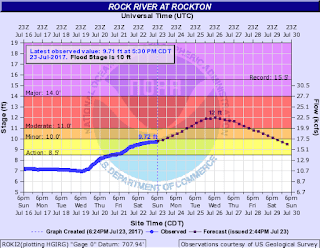 For the month of July, Rockford is currently at 7.43" which is over four inches above the typical 3.28". If you remember back June was also a soggy month, picking up 7.49". That's a surplus of 2.84" for the month. That brings summer's total (meteorological summer including June, July, and August) to 14.92", a whopping 6.99" above where we should be. To put that in perspective, the summer's typical rainfall is 13.19". We aren't even into August yet, and we are over an inch and a half above SUMMER'S typical rain. 10:45pm Update: Heaviest of the rain has now moved east of I-39, with only isolated showers showing up further to the west. Flash Flood Warnings remain in effect for Stephenson, Jo Daviess, Carroll and Whiteside counties until 2am, Flood Advisory for Ogle and Lee counties until 12:30am, Green and Rock counties until 11:30pm and for Winnebago County until 3am. Any additional rainfall this evening should remain light. 10:00pm Update: Flood Advisory issued until 3am for Winnebago County. Rainfall totals up to, two inches of rain have already fallen over parts of the county. It's possible that an additional two inches of rain could occur under the heavy rain showers. 9:00pm Update: Flash Flood Warning has been issued for Stephenson, Jo Daviess, Carroll and Whiteside counties until 2am. A Flood Advisory has been issued for Ogle, Lee and far SW Boone counties until 12:30am and a Flood Advisory has been issued for Green and Rock counties until 11:30pm. the heavy rain won't last too long. But when it comes down, it will be very heavy. Our overall severe threat is decreasing, with heavy rain our greatest threat. (10:02:30 PM) nwsbot: Local Storm Report by NWS MKX: Brodhead [Green Co, WI] trained spotter reports HEAVY RAIN of M1.80 INCH at 09:05 PM CDT -- fell in 80 mins. (8:50:17 PM) nwsbot: Local Storm Report by NWS MKX: 3 ENE Monroe [Green Co, WI] awos reports HEAVY RAIN of M1.94 INCH at 08:35 PM CDT -- measured at the monroe airport (keft) in one hour. (8:47:58 PM) nwsbot: Local Storm Report by NWS DVN: 1 N Savanna [Carroll Co, IL] law enforcement reports FLASH FLOOD at 08:15 PM CDT -- mudslide over portion of rt 84 north of savanna. area currently deemed unsafe. Cloud cover Wednesday afternoon held temperatures down in the upper 70's and low 80's, but the heat index reached close to 90 degrees in many spots. That's because the dew point temperature quickly warmed into the mid 70's. Most of Wednesday afternoon has been quiet, just cloudy. Showers and thunderstorms have been developing along and ahead of a cold front to the north and west this afternoon. Most of the thunderstorms have been sub-severe, with locally strong winds and heavy rainfall. Our severe threat Wednesday evening is on the lower end, however, a few of the stronger storms could produce locally strong wind gusts over 50 mph. 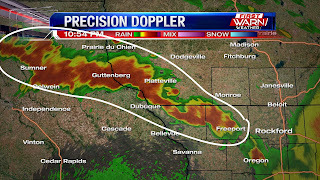 The complex of thunderstorms over eastern Iowa have been steadily marching east and are expected cross the Mississippi River around 7pm, affecting Carroll, Whiteside and Jo Daviess counties first. Most of the storm reports that we have received from the storms in Iowa have been reports of very heavy rain, over an inch within an hour. Because dew point temperatures are so high, any thunderstorm that move in will be capable of producing heavy rainfall. And I think through the evening that is going to be the biggest threat to the Stateline. Storms have been fairly progressive, moving to the east between 30 and 35 mph. So the threat for storms to repeatedly move over the same area is low, but the threat for very heavy downpours remain high. Thunderstorms should be moving east and south of the Stateline roughly after 2am, with skies remaining cloudy through Thursday morning. 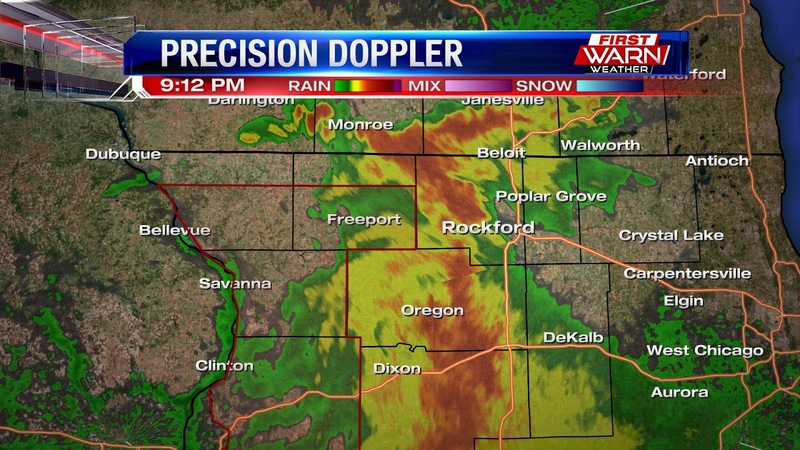 Another round of heavy rain is not exactly what the Stateline needs, but it's possible this evening. Southerly winds continue to draw up a warmer and more humid air mass through Wednesday afternoon. PWAT (or precipitable water/available moisture) values will be again rather high today. Numbers go up to about 2" which means it's possible for 1.50" to 2" of rain to fall across the area. In general, it will be more probable for about 0.50"-1.00" of rain, with locally higher amounts in the stronger storms. The axis of heaviest rain though has shifted to the south, around the Quad Cities, south to Peoria, and near Des Moines. This is where the National Weather Service has issued a Flash Flood Watch, which includes Whiteside county in the Stateline. In this area its possible for up to 2.5" to 3.0" inches. While the Stateline still needs to watch for heavy rain with already swollen rivers, we still need to keep an eye out for potential strong to severe storms. Right now the Storm Prediction Center has northern Illinois and southern Wisconsin under a Slight Risk for strong to severe storms. Heavy rain, hail, and strong winds will all be possible in storms that develop. An isolated storm or two is possible in the mid to late afternoon, around 3/4pm, but the higher chance for strong storms with heavy rain will arrive closer to 6/7pm from the west and will continue through midnight. A few lingering storms will continue through Thursday morning, but the severe threat will be low. An isolated shower will be possible in the afternoon, as there will be a bit of instability present with cooler air arriving. Severe weather and flooding rain can occur anytime during the Spring and Summer months, but we tend to see more heavy rain events during the summer months of July and August. It's important to be prepared for severe weather anytime of the year. Tornadoes have occurred during the fall and winter season, and even heavy rain has occurred when the precipitation was supposed to be snow. So, what's happening in the atmosphere that causes heavier rain to occur during the summer? To answer that we need to look at the jet stream. The reason the jet stream exists is because of the temperature difference throughout the world. The atmosphere is trying to balance itself out. When there is an imbalance, storm systems develop. Jet stream winds are fastest during the winter months because that's when the greatest temperature difference occurs from north to south. During the summer months, jet stream winds are usually weak because the temperature is more uniform. Most severe weather outbreaks in the United States occur during the months of April and May, but can also happen any time of year. During the spring the jet stream winds are still relatively strong because seasons are changing and the warm air trying to overcome the cold air. Because the air during the spring hasn't reached its peak heating, the air mass isn't able to hold as much moisture as it would be able to during the summer. The overall pattern in the atmosphere tends to be a little more progressive, pushing storm systems along rather than developing into a pattern that favors continued rainfall for many hours, or many days. During the summer, the winds within the jet stream are much weaker. Climatologically July is our hottest month of the year. By this time, the air throughout the atmosphere has warmed not only at the surface, but aloft as well. This means the air is now capable of holding a lot more moisture than during the spring. Storm systems (low pressure systems) don't tend to be as strong as they are in the spring and fall. However, as hot domes of air settle into a particular area of the country, a 'ring of fire' pattern tends to develop. This is where the sinking, hot air underneath the high pressure system doesn't allow thunderstorms to develop, but on the outer edges great amounts of instability occur. This tends to set up boundaries that not only low pressure systems travel along, but also allows moisture to build up and produce significant amounts of rainfall. This is also why during the summer months we tend to hear more about 'Derecho' type thunderstorms - or long lasting complex of thunderstorms that move over several hundred miles from its starting point, producing damaging winds along its path. Jet stream winds will then begin to increase towards the fall months as the season begin to change and cooler air starts to move back south. The National Weather Service continues to monitor river levels throughout the Stateline. For a quick glance at where river levels are currently, click here. Flood waters are beginning to recede for some, but may continue to rise for others this week. 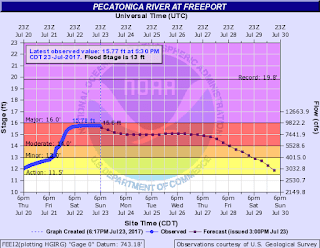 The Pecatonica River in Freeport did crest over the past weekend just below major flood stage (16 feet), and has slowly begun the process of going down. It'll still be some time before river levels are expected to drop below flood stage. That might not happen until after the beginning of August. 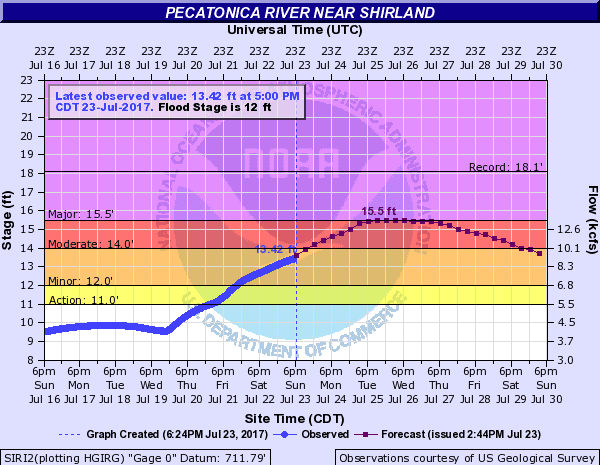 The Yellow Creek that runs through Stephenson County, and was the source for the significant flooding throughout Freeport - along the southern end - Pearl City and Lena, has also started to come down. Emergency managers in Stephenson County indicated that flooding continues, but mostly on the lower end of Yellow Creek. Water levels dropped several feet Monday night into Tuesday. 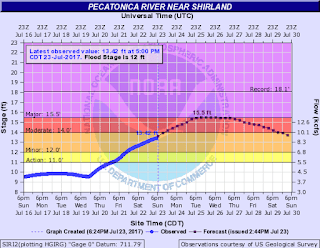 The Pecatonica River near Shirland has not reached its crest point yet. That is expected to occur either late tonight or early Wednesday morning. This river, like in Freeport, will crest just under major flood stage of 15.5 feet. High river levels are expected along that portion of the river through at least early next week. 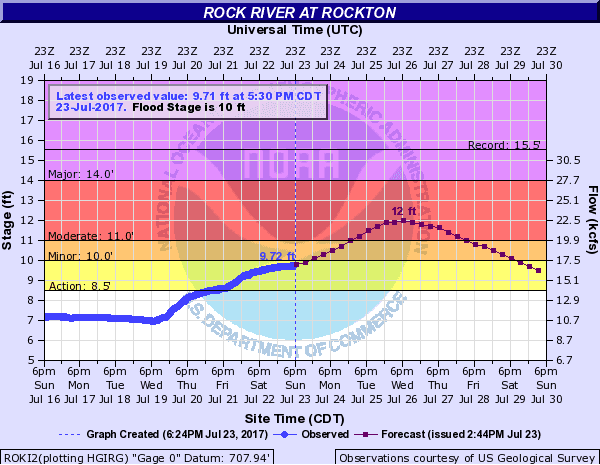 The Rock River at Rockton continues to climb and is currently at minor flood stage. Right now the forecast has the river cresting within the next 24 hours, or by Wednesday evening, just above moderate flood stage of 11 feet. 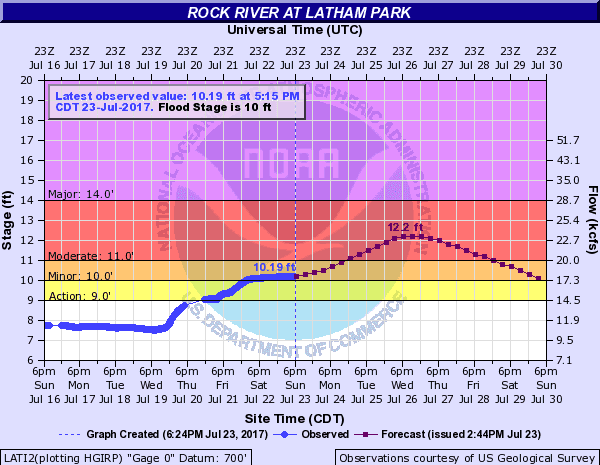 The Rock River at Latham Park has also not reached its crest point. That is expected to occur either Wednesday or Thursday evening. Right now the river is at minor flood stage, but is expected to reach moderate flood stage and cresting just above 11 feet. The Rock River in Byron did crest early last weekend at moderate flood stage. River levels at this point continue to decrease, falling below minor flood stage by late in the week. 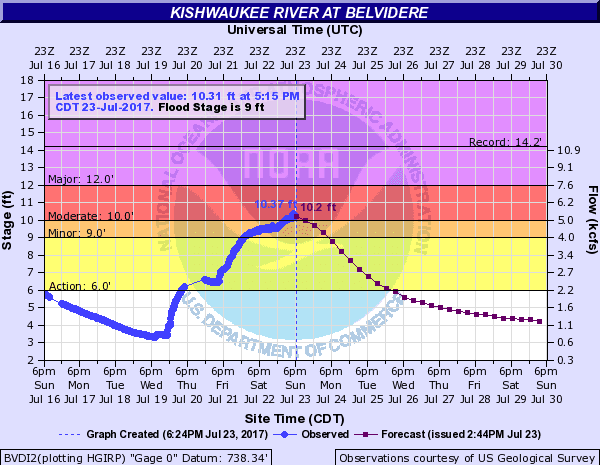 The Kishwaukee River at Perryville did crest at 15.3 feet over the weekend and has been on a steady decline ever since. 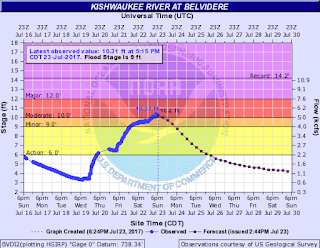 The Kishwaukee River at Belvidere did crest late Sunday evening at 10.38 feet. River levels are expected to continue to decrease, falling below flood stage by the weekend. It was a cooler start this morning with temperatures in the upper 50°s for the morning commute. We even had a little bit of fog this morning because of the cooler temperatures. A low pressure system out west is bringing in a weak inflow of warmth and moisture, and combined with the clear skies and sunshine temperatures warmed up more rapidly. The weak heat and moisture inflow will build some clouds, but we'll still see a good amount of sunshine. We also have a high pressure system out east, which will keep the heat inflow weak and prevent temperatures from getting too hot. We'll see temperatures in the upper 70°s this afternoon with a little less humidity. That high pressure influence will last through the late-night hours, but will move out during the overnight where the low pressure system to the west will be able to strengthen its heat inflow. This will keep temperatures warmer during the overnight in the upper 60°s, and increase our cloud cover early tomorrow morning. A cold front extending from a low pressure system up north will makes its approach during the day tomorrow. It will help build cloud cover in the morning, and bring us a chance for showers around 1pm. 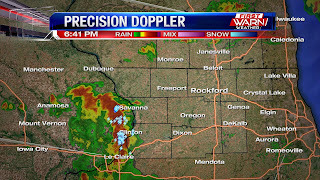 By 4pm, it will move into the Stateline area and develop some fairly strong thunderstorms. We are under a Slight Risk for severe weather tomorrow late afternoon and early evening. The main threats will be strong winds, and up to half dollar size hail is possible. The storms will die down around 1am Thursday, with some lingering rain afterwards until around 4am. The front will move out around 7am, where high pressure moves in from the north to keep us cool and dry with temperatures in the mid to upper 70°s for the rest of the week, and even the weekend. The effects of Friday's heavy rain and severe storms are still being felt this morning. There are multiple Flood Warnings in place for both northern Illinois and southern Wisconsin. 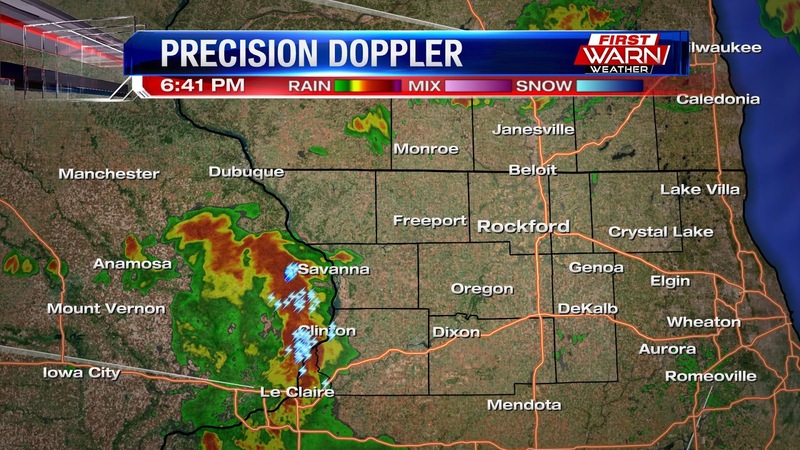 Back building storms dumped the most amout of rain over western Stephenson county and Jo Daviess county. In this area, roughly 6-8" of rain fell, while just south of that area 4-6" was recorded. Most of Winnebago and Boone received 2-4" and thankfully McHenry and Walworth counties received the least amount of rain, after the experienced quite a bit of flooding from storms in early July. Here is a graphic made by the NWS that shows rain totals across northern Illinois over a 72-hour period of time: (you can click on the image to make it bigger). Heavy rain caused quite a bit of flooding in the Stateline, from Pearl City to Freeport, to portions of Rockford due to swollen rivers. 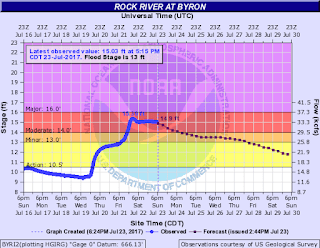 To find out about current river level conditions across the area, click here. All you have to do once you are on the page is move your cursor over the river level you want to examine. The different color dots corresponds to the stage of flooding the river is at currently, at the position. Dew point temperatures have been slow to come down Sunday afternoon. The high moisture and incoming cold front prompted a few thunderstorms, some of which turned severe, to develop Sunday afternoon and early evening. Most of those storms have now moved out of the immediate area, with skies remaining partly to mostly cloudy through the evening. Drier air (lower dew points) will follow the front late Sunday night and throughout the day on Monday. This will help wipe out the high humidity that we've had for the past week. Unfortunately the break doesn't last too long, because an incoming cold front will shift winds back around to the south late Tuesday night. This will help draw in quite a bit of moisture into the Midwest during the day on Wednesday and Thursday. An incoming cold front Wednesday afternoon will likely trigger strong to severe thunderstorms over parts of Minnesota, Wisconsin and northern Iowa. As the cold front sinks south, the threat for thunderstorms will shift south as well. The set-up in the atmosphere does not support the repeated rounds of heavy rainfall like we just experienced, however, the high moisture in the atmosphere will support the possibility of thunderstorms to produce quick heavy downpours. The good news is the storms will be out by Thursday with drier days leading into the weekend. The only two days this week with a 'Moderate' Weatherisk are Wednesday and Thursday. Every other day we've got a 'green' light. Flood Warnings continue for the Rock, Pecatonica and Kishwaukee Rivers with most of the warnings lasting 'Until Further Notice' There have been a few locations on the Rock and Pecatonica where the river did already crest and will either hold steady at the current level, or begin to gradually come down by the end of the week. River forecasts suggest that the river levels will remain in flood stage for at least the next 7 days. It's important to remember to stay away from any area that is experiencing flooding. Whether that be a river, creek, back yard or stream. Currents are strong in both rivers and creeks when flooding occurs and this can quickly wash you away if you fall in. 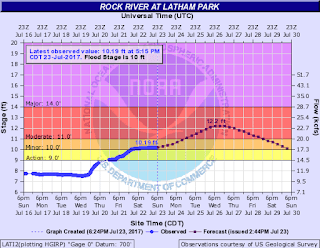 Because of the high river level, debris and fast current the Illinois Department of Natural Resources (IDNR) did close the Rock River 'Until Further Notice' in Winnebago, Ogle, Lee and Whiteside counties. Below are the current river levels, as of 6pm Sunday evening, and when their expected time is to crest. Please click here to continue to monitor river levels throughout northern Illinois and southern Wisconsin. We had some light rain linger early this morning, and this didn't help at all with the already flooded areas that we got from the heavy downpours the night before. Some places had rainfall rates over 1"/hour, which is very high. Flooding will continue to be a concern going through the weekend and into next week as river levels will begin to crest. 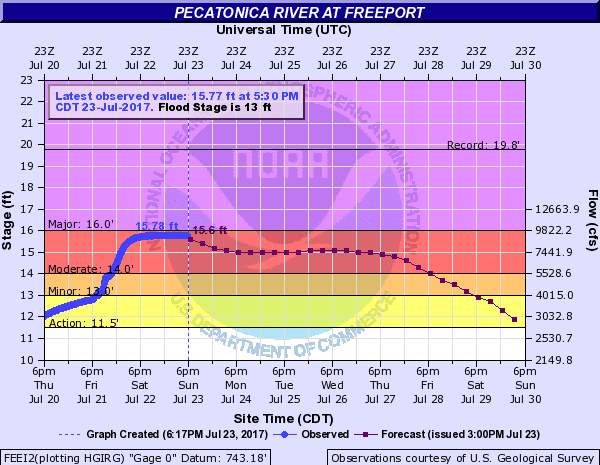 The Pecatonica River in Freeport will crest on Wednesday, and the water levels will be just above major flood stage levels by that time. Luckily, drier weather is now in place as that low pressure system that brought us the heavy rainfall has begun to move out of our area, causing the cloud cover to decrease. Clouds will continue to decrease as we head through the overnight, but it'll still be fairly warm and muggy with all the moisture from the rain. That low pressure system will linger off to the east tomorrow afternoon, giving us just enough instability to allow for a slight storm chance between 3-4pm. However, high pressure will begin moving in during the afternoon as well, so more than likely storms won't occur. Temperatures will manage to hit the upper 80°s with lingering humidity, the reason being that the high won't be close enough to bring in cooler temperatures. The drier trend for next week will be due to two upper level lows in the Pacific Northwest and the northern Great Lakes. This will allow for stronger meridional flow in the jet stream to occur over the northern plains, which is where surface lows will form. This will bring us a storm chance on Wednesday, but that upper low to the northwest will track eastward and push the jet stream further southward. This will allow for surface lows to stay down in the plains, and the heat and humidity to stay away from us. Temperatures will cool to the mid to upper 80°s when the high moves in for Monday and Tuesday. That low, which will develop in the plains due to the upper level ridging, will form on Wednesday and bring us some storms. The jet will make the southward track on Thursday, and stay that way afterwards through the end of the week. Temperatures will be in the upper 70°s to end the week. 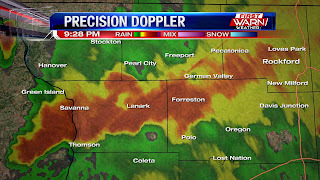 We've been having thunderstorms move through the Stateline since 4pm Friday, all of which brought heavy rainfall and some strong winds through the Stateline. There have been multiple reports of trees being down, with radar indicating winds anywhere from 45-60mph. 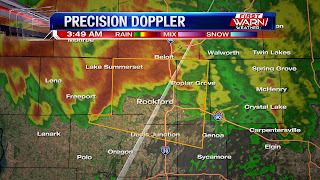 One storm developed a Bow Echo down in Whiteside county, where radar estimated wind gusts of around 70mph. This resulted in a barn being blown down, the barn being located 2 miles northeast of Fulton. The continuous inflow of heat and humidity is what's fueling these thunderstorms, and it will continue to fuel those storms as we go through the overnight into tomorrow morning. Luckily, the thunderstorms produced the stronger winds west of the Mississippi River, only producing heavy rain once they crossed over into the Stateline area. The reason for this was instability and wind shear were much higher out in northeastern Iowa, where our instability and wind shear was much lower, so the storms couldn't stay as strong as they were out in Iowa. The storms have begun to move more southward since they're trying to feed off the heat and humidity inflow out of the south, so the heavier rainfall will be moving southward and will mostly move through Whiteside county. 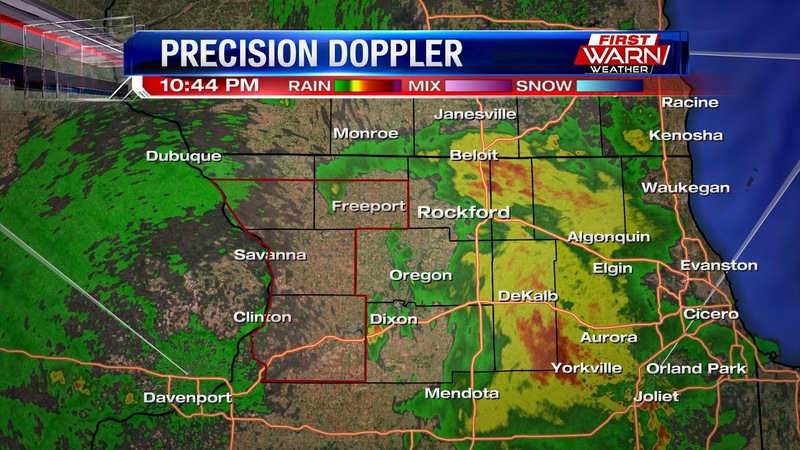 Light to moderate rainfall will still be seen across the Stateline going through the overnight into tomorrow morning. However, any additional rain, whether it's light or heavy rainfall, will still add to the already flooded areas that we've gotten from the heavier, more persistent rainfall. Flooding will be the main concern going through the overnight and into tomorrow morning. Tomorrow afternoon will be mostly dry, with a small chance for a thunderstorm late afternoon. Sunday through Tuesday will be drier with a high pressure influence in place, but it'll still be fairly humid. Another low moves in mid-week, bringing us showers for Wednesday and Thursday. We're looking to end the week on a dry note. Temperatures will stay in the mid 80°s to near 90° for Saturday and Sunday, with dew point temperatures staying around 70°, so we'll keep the heat and humidity for the weekend. The drier weather on Monday and Tuesday will cool off temperatures, but it'll still be a little humid with dew point temperatures in the mid 60°s. 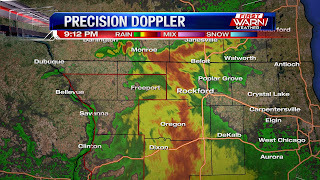 12:15pm Update: Severe Thunderstorm Warning for Jo Daviess, Stephenson and Carroll counties has allowed to expire. The line of storms have fallen below severe limits, but still could be capable of producing 30 to 50 mph wind gusts. 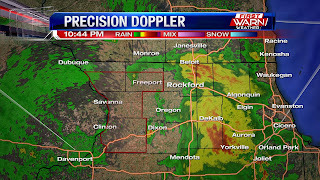 (12:21:42 AM) nwsbot: Local Storm Report by NWS DVN: Stockton [Jo Daviess Co, IL] co-op observer reports HEAVY RAIN of M5.79 INCH at 12:13 AM CDT -- rainfall since 545 pm...still raining. Severe Thunderstorm Watch has been extended until 2am for Winnebago, Boone, McHenry, Ogle, Lee and DeKalb counties. 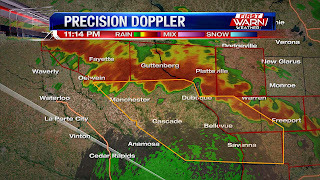 Severe Thunderstorm Watch has been extended until 2am for Stephenson, Jo Daviess, Carroll and Whiteside counties. Strong winds, hail and extremely heavy rainfall will likely continue into the night. 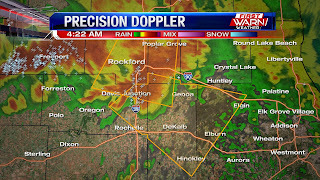 Severe Thunderstorm Warning for Jo Daviess, Stephenson and Carroll counties until 12:15am. 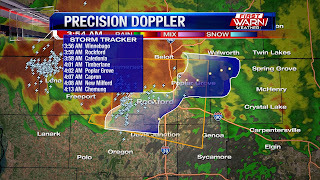 60 mph wind gusts and penny sized hail are possible with these storms. 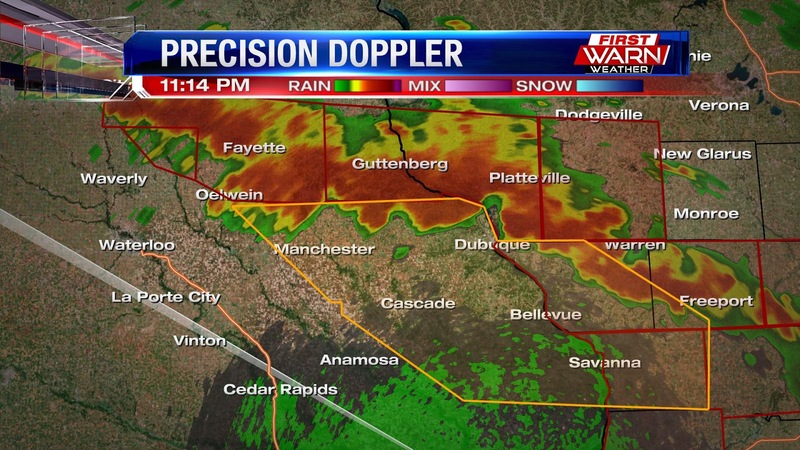 Severe warned storm is currently in northeast Iowa and moving southeast at 40 mph. Thunderstorms have developed over northeast Iowa and northwest Illinois as the low level jet has started to develop out to the west. 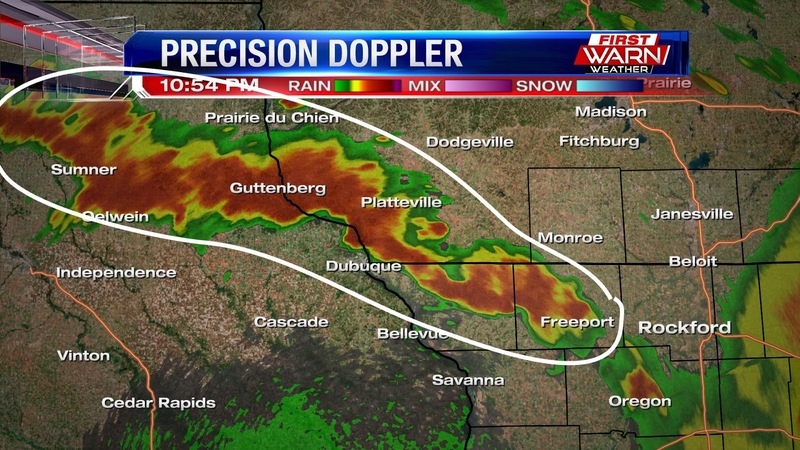 This has caused a line of thunderstorms to develop and remain fairly stationary over Iowa and Illinois. Ongoing flooding over northwest Illinois will only worsen with the incoming rain. We've received reports of roads closed in Lena due to flooding as well as in Cedarville due to standing water on several county roads. (10:15:42 PM) nwsbot: Local Storm Report by NWS DVN: Cedarville [Stephenson Co, IL] law enforcement reports FLASH FLOOD at 09:00 PM CDT -- portions of several county roads barricaded due to high water. time estimated by radar. (10:28:36 PM) nwsbot: Local Storm Report by NWS DVN: 1 N Lena [Stephenson Co, IL] emergency mngr reports FLASH FLOOD at 09:00 PM CDT -- highway 73 at louisa road closed due to flooding. time estimated by radar. 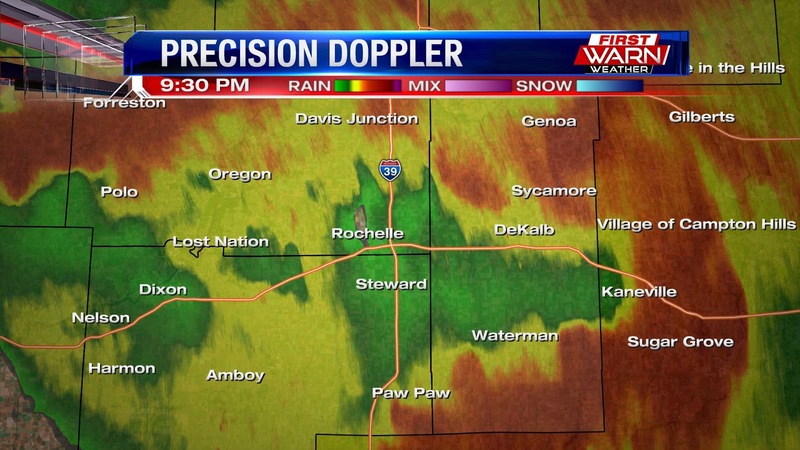 Heavy rain coming down over northern and southern DeKalb County. Please remember to NEVER drive through a flooded roadway, especially at night. 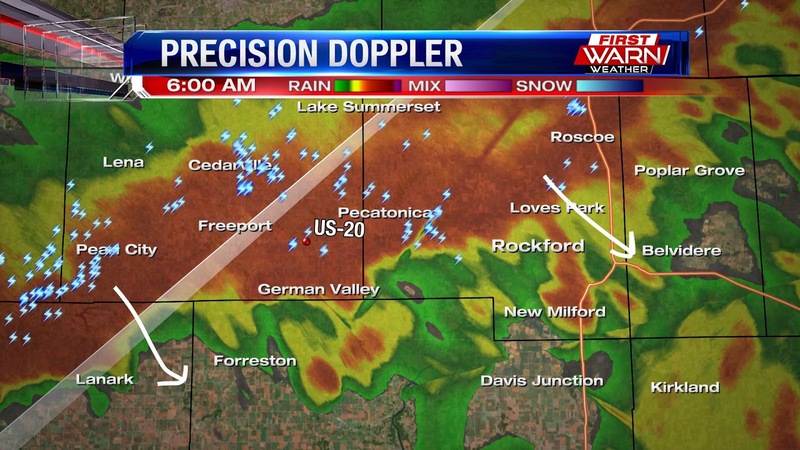 Extremely heavy rain coming down from Winnebago, southwest into Carroll County. Rainfall rates close to an inch and a half per hour are likely. (8:56:23 PM) nwsbot: Local Storm Report by NWS LOT: SSW Ashton [Lee Co, IL] cocorahs reports HEAVY RAIN of M0.67 INCH at 08:28 PM CDT -- 0.67 inches of rain fell in 12 minutes. 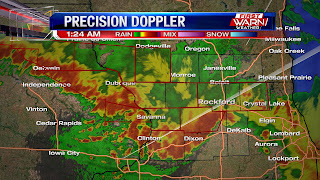 Flash Flood Warnings have been issued for Jo Daviess, Stephenson, Winnebago, Boone, McHenry, Ogle, Carroll and Whiteside counties through early Saturday morning. 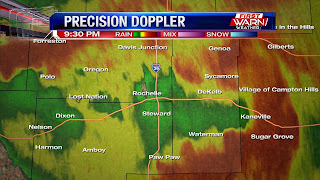 Significant rainfall has been falling throughout the Stateline with radar estimated totals over two inches. 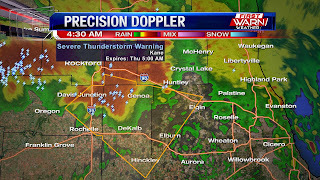 Severe Thunderstorm Warning for DeKalb County until 9pm. 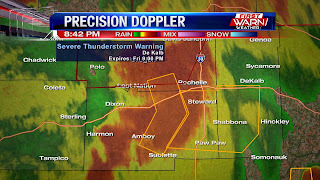 6:30pm Update: Severe Thunderstorm Warning for Ogle County has been issued until 7:15pm. 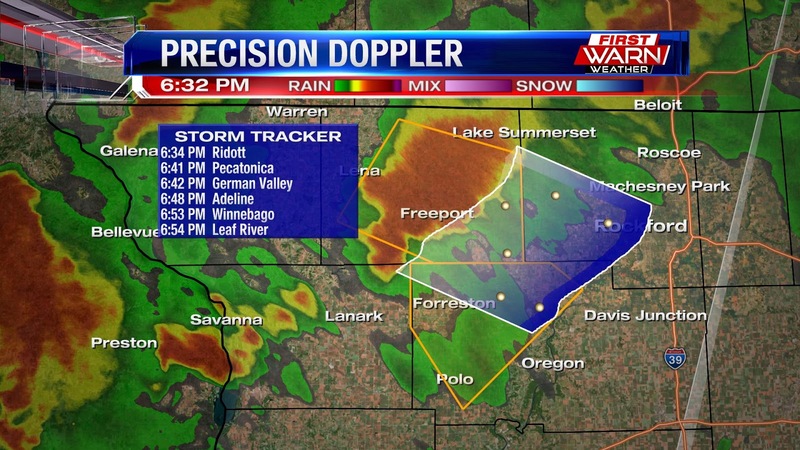 Storm is located near Ridott and moving southeast at 35 mph. 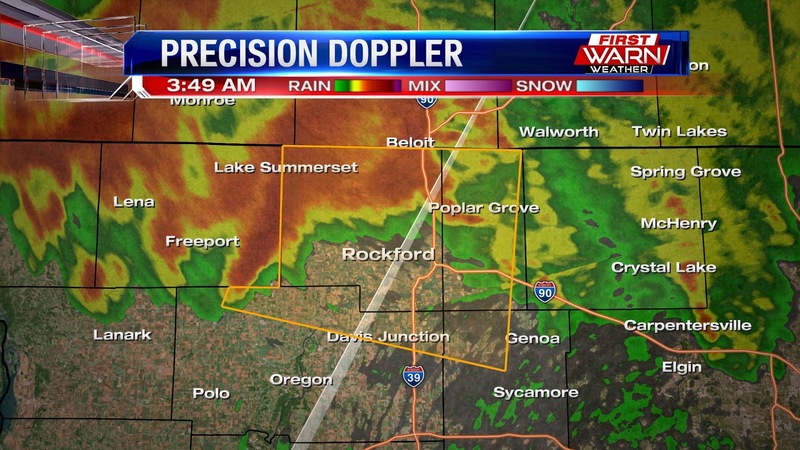 Wind gusts to 70 mph and quarter sized hail possible. 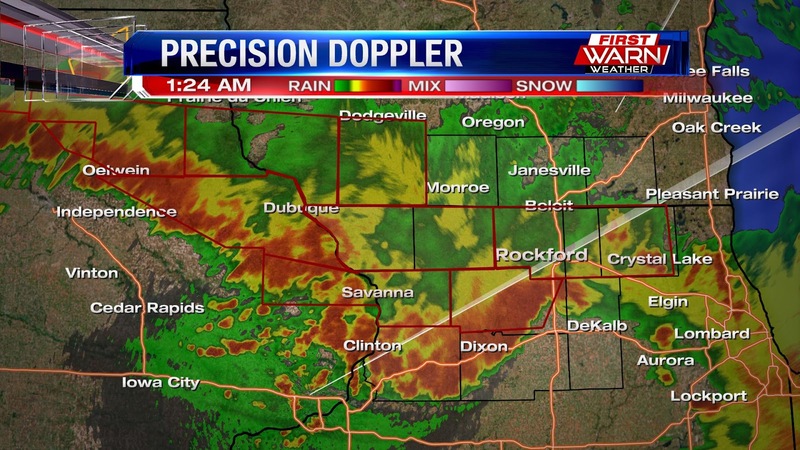 Flash Flood Warnings have been issued for Ogle, Stephenson and Jo Daviess counties until 1:45am. Radar estimated rainfall totals of two inches have bee recorded, with additional 1" to 2", possibly 3" per hour. 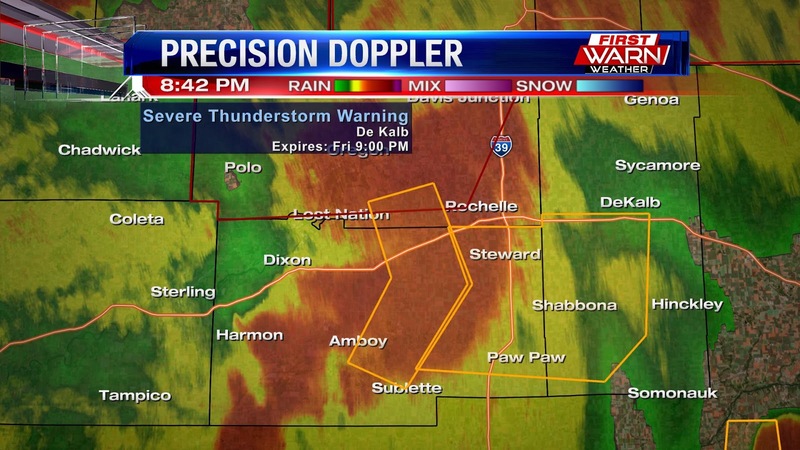 A Severe Thunderstorm Warning has been issued for Stephenson County until 7pm. 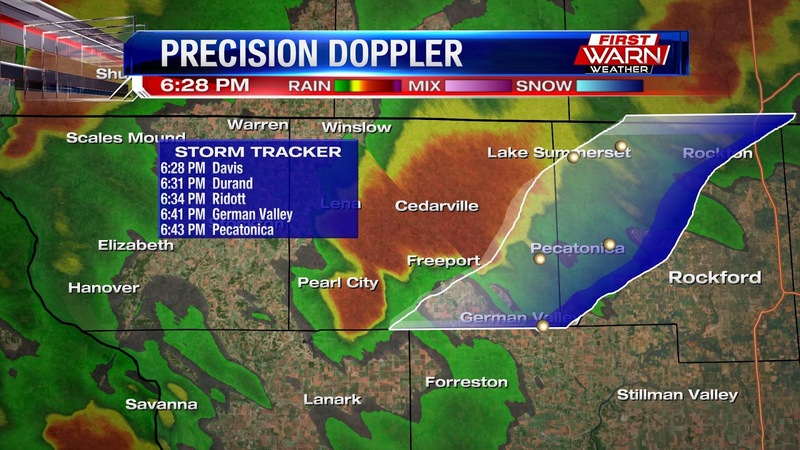 Storm was located just west of Freeport and moving southeast at 30 mph. 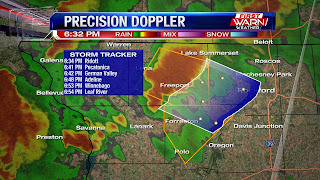 Quarter sized hail will be the biggest threat for storms, but also watching the potential for strong winds just southwest of Freeport. Remain indoors and away from windows until the storm passes. A Severe Thunderstorm Watch has been issued for all of northern Illinois and southern Wisconsin until Midnight. One round of thunderstorms moved through earlier Friday afternoon, with additional thunderstorms expected to move in from the west. Damaging winds, hail and very heavy rainfall will all be possible. It's been a hot, humid, and active week....and unfortunately the forecast for Friday will be more of the same. A few isolated to widely scattered storms will be possible later Friday afternoon, as a stationary boundary lifts through northern Illinois as a warm front. The warm front lifting into southern Wisconsin is in response to a low pressure system strengthening in the Plains. Any storm that develops this afternoon will still have periods of heavy rain that will be possible because of the very muggy air mass. It's a very tropical airmass with dew points that will be climbing into the mid and upper 70's. The time period we really want to pay attention to is this evening, especially after midnight. Storms late today will develop west in Minnesota and will head southeast this evening. Storms will form into an MCS type system which is essentially a cluster of storms which can produce heavy rain and strong straight line winds. One forecast update from Thursday, is that the axis of heaviest rain has been shifted slightly north. 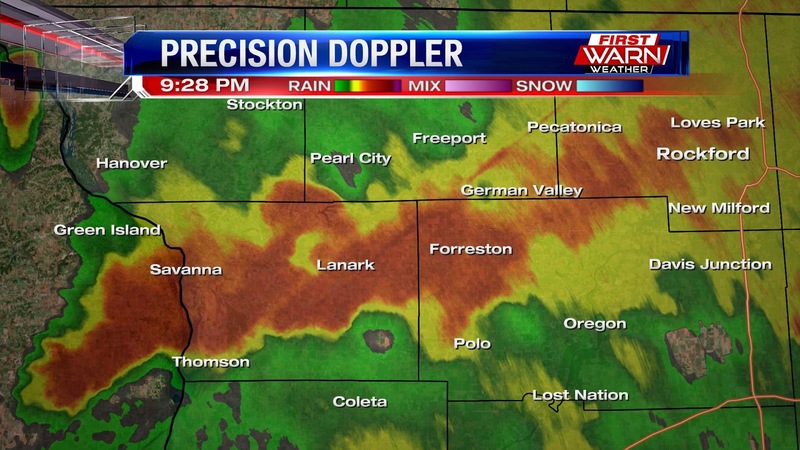 This is good news for the Stateline, which has already been hit with an abundance of heavy rain. The Stateline area isn't out of the woods though just yet, 1-2" of rain is still possible across far northern Illinois, and 2-4" is more likely through southern Wisconsin. This could pose big problems for those planning to head out to Country Thunder in Twin Lakes Wisconsin. If you are camping overnight Friday, make sure to have multiple ways to receive any watches and warnings should we have them. There is still an enhanced risk for strong to severe storms across far northwest Illinois and southwest Wisconsin, while the rest of the area will be under a slight risk. The biggest threats will be strong winds and very heavy rain with the possibility of flash flooding. Make sure to check back for more forecast updates through the day and into the weekend. A Flash Flood Watch has been issued for southern Wisconsin and northern Illinois beginning Friday afternoon and lasting through Saturday morning. Rainfall amounts from Wednesday evening and Thursday morning ranged anywhere from one to four inches of rain! Additional rainfall from thunderstorms late Thursday night, and especially Friday night into Saturday could range anywhere from another two, up to four inches! This would likely cause significant flooding to occur over parts of the Stateline. Currently there are Flood Warnings for the Kishwaukee River near Perryville and for the Pecatonica River near Shirland and Freeport, as well as Flood Advisories for the Rock River. You can monitor local river levels here. Along with the threat for flooding rain, severe weather is also possible Friday and Saturday. We are currently under a 'Slight Risk' for strong to severe thunderstorms the next two days. Biggest threats from storms on Friday would be heavy rain and damaging winds, while on Saturday wind, hail and heavy rain would all be possible. Please make sure you have a way to receive watches and warnings should those be issued this weekend. Remain aware of the flooding situation and remember to NEVER drive through a flooded roadway. 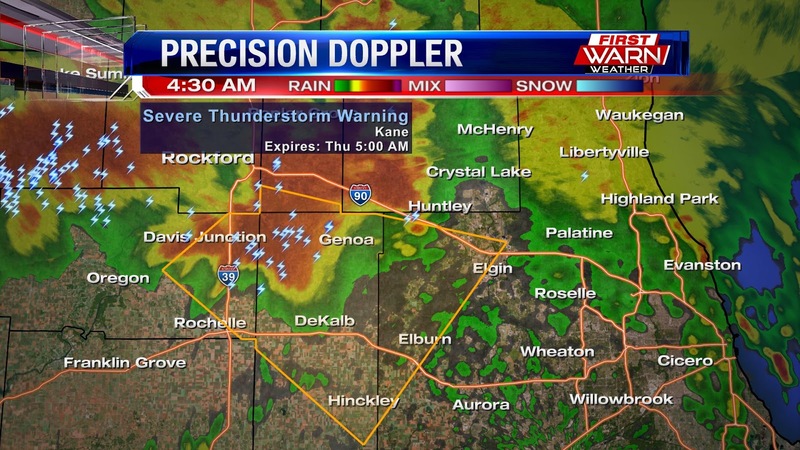 6:am Update: No severe storm warnings, but strong storms are still making their way through the Stateline. Torrential rainfall and a lot of lightning - right along US-20. Take it slow this morning and watch for ponding on the roads. 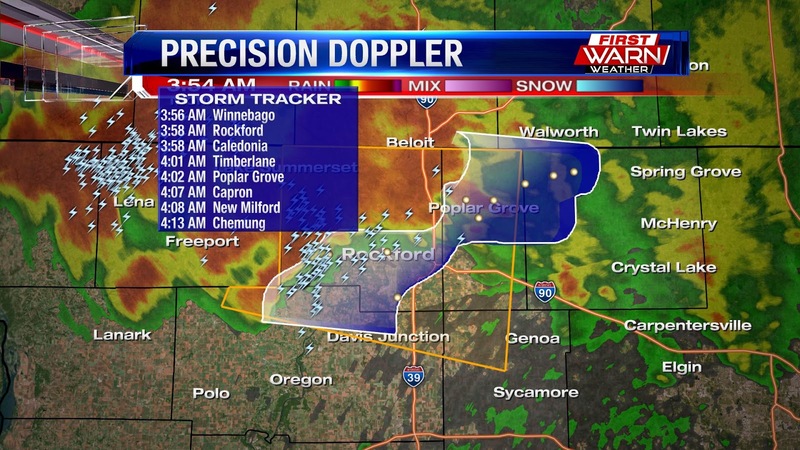 4:20am update: Severe storm warning issued for Ogle, DeKalb, and Boone co. Golf ball sized hail and 60mph winds. Storm has history of producing golf ball sized hail. 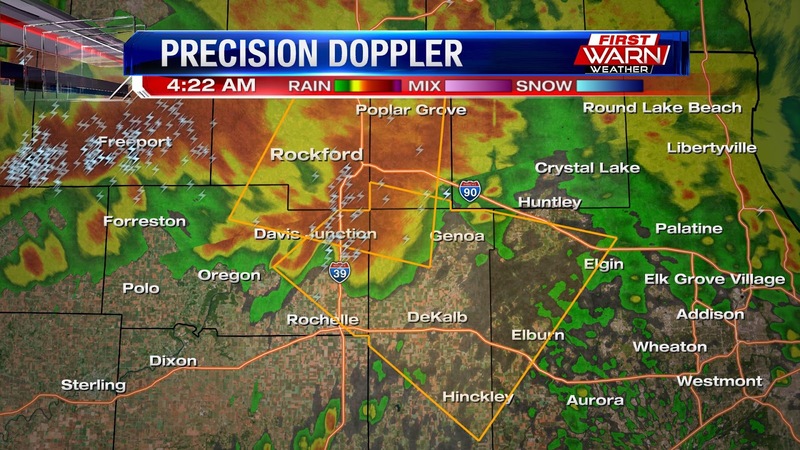 Severe thunderstorm warning for Winnebago, Boone, NW DeKalb, & NE Ogle until 4:30am. 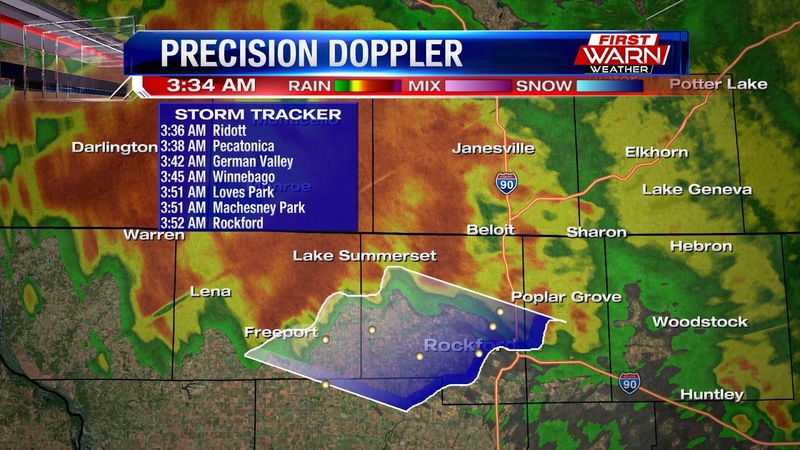 Moving east @30mph,wind gusts near 60mph, and nickel hail.